P4/5 are doing the Easter play. The play is called the Selfish Giant,I am called Bob in it. It is very hard to remember all my lines but I try my best. My favorite seen is scene one. 1. You will need a good memory for the script. 3. Either be very tall for a giant or have building skills. 5. Don’t speak too fast. 6. Know which side to go onto the stage. 8. Have enough people for all the characters. 9. You will need to practice. We are doing a play on the selfish giant and we need a lot of skills well one of them is Expression also movement, we need to learn our words off by heart. 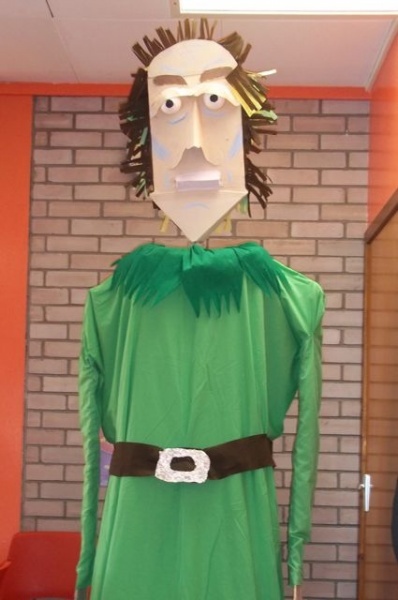 It is our classes turn to do the Easter assembly we are doing it on the Selfish Giant I am Flora the brainy box. Our play is this Thursday I am very very excited!!! We have made a giant out of a chair we have a voice for the giant and a puppeteer. We all wrote at least one line in the play. We have had to think about how much time we have to get everything ready. We have made lots of things we have brought in costumes from our houses we are all very excited. P4/5 are doing a play named The Selfish Giant, which is adapted from a short story by Oscar Wilde. In another blog I have written about the cast but now I am going to give you more details about the play. Firstly, we had to write the script so we all wrote a different part of the story. Then we put it all together. Our teacher, Mrs. Clark, added a few more lines and jokes, so everyone in the class has a part. The next stage of our task was to design costumes. We had some from pantomimes we have done in the past and also we brought clothes from home. The third thing we had to do was very hard. We had to make the giant and he was going to be a very big puppet. There were two people controlling him, one for moving him, and the other for his voice. By the end of Thursday he was nearly completed. We just needed to put the head on. But Mrs. Clark put it on that evening and it stunned us all when we walked into the classroom on Friday morning. In the story there is a scene set in Winter and two scenes set in Spring. To change the seasons some of us got two gigantic pieces of paper. One side was white to show it was Winter, and on the other we painted a spring scene. On Thursday we watched two ‘How To’ videos, one to show how to draw a tree in spring and the other of a tree in winter. Everyone’s tree was very good, but we had a vote to choose the best three from each season. The children whose spring trees were chosen were Abbie, Robbie and David, and the winter ones were Ciara, Maisie and me(Harry). We also have some songs and even dances. Here they are in order. Firstly ‘Will you still need me, will you still feed me when I’m 64?’ which is a song by the Beatles. Then ‘Can’t Touch This’ which has a dance to it. After that the Spring does a dance with a bird which does not last for very long. Then the Snow, Frost and Hail do a ballet, which changes into a different dance called ‘Ice, Ice Baby’ and the North Wind joins in too. The final song is ‘Heaven Is A Place On Earth’. I hope The Selfish Giant will be a great success. And thanks to Mrs. Clark for directing it and Oscar Wilde for writing the story.